Learning to play chords is often a primary desire of many new guitarists. This stands to reason since it’s a fun element of playing the instrument. And though it may be best in some cases to begin your study by learning single notes and developing the fretting hand fingers independently, there are several chords that aren’t too difficult and can lead beginners to playing songs quite quickly. Below are 3 popular chords. In a moment, we’ll use them in the context of the Blues, but you’ll find purpose for these chords in many other styles and genres. Notice that they all have a “7” after the chord name. This will take some theory to explain why, so we’ll keep that for another lesson, but you can think of the 7 as just another type (or quality) of chord. They’re similar to major chords, but are a little rougher around the edges, making them great for Blues. Click here if you need help understanding these chord charts. Place the fingers in the correct position, and try to be as close to the upper fret as you can for each note. Strum through the strings individually from the lowest note of the chord to the highest to check that all strings are ringing clearly. Take your hand away from the neck, bring it back, and try to form the chord again without using the assistance of the diagrams above. Practice transitioning between 2 of the chords, strumming each chord 4 times. Loop each example as many times as you’d like. The 12 Bar Blues Progression is one of the most widely used chord progressions in modern popular music. Not only do we hear this progression in Blues, but also in anything that blues once influenced including jazz, rock, rockabilly, bluegrass, country, folk, and even some classical music. 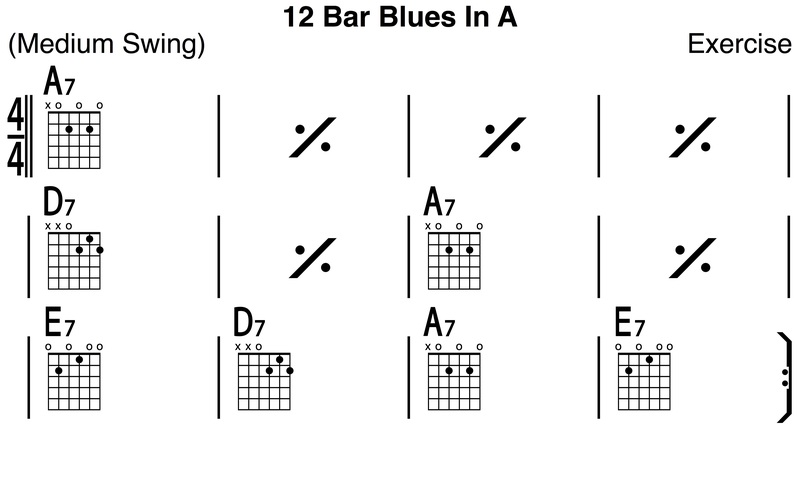 “Bar” is another word for measure, and thus as the title “12 Bar Blues” implies, it’s often 12 measures in length. Though there are many variations, here is the basic layout below. The symbol used in the second measure is the Repeat Measure Symbol. It indicates that you should continue playing the same chord from the previous measure. Therefore, the A7 chord will last for 4 measures until you change to 2 measures of the D7 chord beginning in the 5th measure. Follow the progression with a simple strumming pattern – 4 down strums for each measure is great to help you keep track of where you are. Try more advanced strumming patterns once you feel like you can play the progression without the assistance of the chart. When ending the 12 bar blues, the last chord you play should be the same chord that you started with – in this case, A7. A metronome is an excellent tool to help you maintain a steady tempo. Once you feel like you can play through the progression with limited difficulty, try playing along with a backing track. The first track is a slower tempo (60 beats per min), while the second is for when you’ve had some coffee and are ready to move quickly (120 bpm).